Carrie Underwood looked stunning at the 2016 Country Music Television Awards in early June. She’s lost about 30 pounds of baby weight since giving birth to her son Isaiah in February last year, and credits her weight loss to intense exercise and a vegan diet. The 33-year-old singer and songwriter showed off her slim physique at the awards show with three different looks, including a floral gown, a sheer black jumpsuit, and a long-sleeved gold-sequined mini. Underwood’s exercise routine includes 90-minute high-intensity interval-training workouts with trainer Eve Overland six days a week. Her other favorite exercises include weightlifting, kickboxing, jump squats, tuck jump burpees, weighted sumo squats, and Bulgarian splits. She also enjoys stationary cycling, treadmill running, back lunges with biceps curls, front lunges with a torso twist, and a bridge pose with a stability ball. Carrie Underwood showcases her slim figure @ the 2016 American Country Countdown Awards. Credit: AXELLE WOUSSEN/Bauergriffin.com. Although Carrie Underwood has a demanding work schedule, her health continues to be a priority. What secrets help keep her body bikini-ready? Keeps a food log: In her food log, she records everything she eats. This strategy ensures that she makes healthy diet choices. Follows a vegan diet: She ensures proper nutrition through a vegan diet with plenty of vegetables and fruit. Breakfast is her bigger meal, and she often enjoys steel-cut oats with berries and maple syrup, and sometimes toast with vegan butter. Lunch is often quinoa and brown rice with tofu and vegetables, and dinner is vegetables and a protein. Avoids white carbs: Underwood does her best to avoid white carbs such as white bread, pasta, potatoes, and sugar. These foods increase blood sugar levels quickly and can make it difficult to lose weight. Eats high-fiber foods: High-fiber foods are essential for losing weight. Underwood loves eating high-fiber oatmeal, vegetables, fruits, seeds, and nuts. 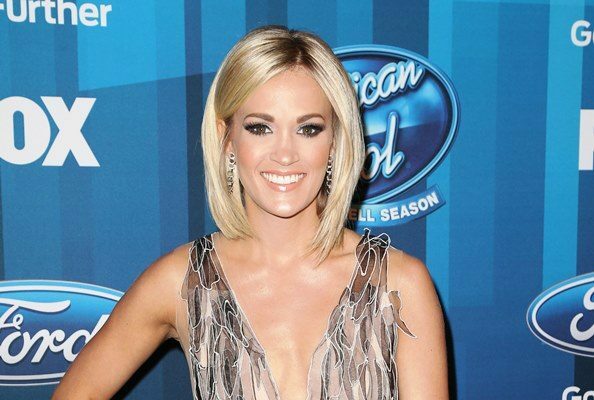 A vegan diet and exercise are very important to Carrie Underwood. Weight loss can be difficult after pregnancy, but Underwood understands that a healthy lifestyle leads to easy weight loss. It also helps that she eats lots of plant-based foods and exercises extensively. Lempel, R., “Carrie Underwood Looks Gorgeous! Weight Loss after Giving Birth Shows Diet and Exercise Made a Big Difference for the CMT Stunner,” Hollywood Take web site, June 9, 2016; http://www.hollywoodtake.com/carrie-underwood-looks-gorgeous-weight-loss-after-giving-birth-shows-diet-and-exercise-166711, last accessed June 29, 2016. “Carrie Underwood Workout Routine and Diet Plan,” HealthyCeleb web site; http://healthyceleb.com/carrie-underwood-workout-routine-diet-plan/11851, last accessed June 29, 2016. “Carrie Underwood’s Hot Bikini Body Workout & Diet for Summer,” Hollywood Life web site, May 25, 2016; http://hollywoodlife.com/2016/05/25/carrie-underwood-bikini-body-secret-workout-diet-toned-legs/, last accessed June 29, 2016. “Carrie Underwood Reveals Her Weight Loss Secrets,” PK Baseline web site, December 2, 2015; https://www.pkbaseline.com/carrie-underwood-weight-loss-diet-workout, last accessed June 29, 2016.